The life of Antoine-Louis Barye spans one of the most turbulent periods in French history. Born in revolutionary Paris on 24 September 1795, he lived through two empires, two revolutions and three republics, as well as the nightmare of the 1870-71 Franco-Prussian War. Like many of his Romantic colleagues, Barye’s work reflects the ferocity of his time, although it also captures the spirit of scientific inquiry that characterized nineteenth century Europe. Barye’s early years were typical of a working class family; he learned his father’s craft of goldsmithing, and by 1808, at age 13, he was apprenticed to the military equipment engraver, Fourier. He subsequently worked for Napoleon’s goldsmith, Martin-Guillaume Biennais, learning every facet of metalwork from casting to engraving. At age 21, however, he entered the sculpture workshop of the neo-classical artist, François-Joseph Bosio, who had created the bas-reliefs for the Vendôme Column. This proved to be short-lived; Barye began studying painting a year later with Antoine-Jean Gros, and in 1818, he was accepted into the Ecole des Beaux-Arts. During his five years at the Ecole, Barye distinguished himself with honors in 1819, 1820 and 1823, but equally important was the emergence of his aesthetic direction as an animalier, an artist specializing in the depiction of animals. His inclination for this subject matter can be seen as early as 1819 in the engraved medallion of Milo of Croton Devoured by a Lion, the project that won him an honorable mention at the Ecole. Although ostensibly a portrayal of a classical academic subject—the 6th century BCE Greek athlete, Milo—Barye’s attention was riveted on the lion. His fascination with animals was reinforced as well by his work for the goldsmith, Jacques Henri Fauconnier, for whom he created animal figurines in order to meet his expenses during the 1820s. In addition to his frequent sketching trips to the Jardin des Plantes where he could observe exotic animals directly, Barye’s intellectual curiosity increasingly led him to read the scholarly literature on zoology and natural history. 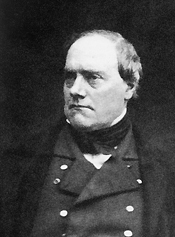 In particular, he was well versed in the writing of the Comte de Lacépède, the natural scientist who headed the reptiles and fish section of the Jardin; and the innovative thinking of Georges Cuvier, who helped establish paleontology and comparative anatomy as independent fields of study. Barye also attended anatomy classes taught by Geoffroy St.-Hilaire, the chairman of the zoology department at the Musée National d'Histoire Naturelle—and the man most responsible for creating the zoo at which Barye found his inspiration. With this somewhat unusual, but remarkably sensible, training in zoological studies, Barye prepared himself thoroughly in his chosen subject matter, as well as in the artistic skills he would need for his career. His Salon debut in 1827 was largely unnoticed by critics, but in 1831, he received a silver medal for Tiger Devouring a Gharial [crocodile] on the Ganges, a subject that appealed to the exotic strain in French Romanticism, as well as to the burgeoning interest in nature’s frequently gruesome patterns of survival. Two years later in 1833, Barye submitted a plaster sculpture of Lion Crushing a Serpent to the Salon as an allegorical commemoration of the July Revolution of 1830. Although it would be cast in bronze for the Salon of 1836, it did not bring Barye the official commissions that he hoped for—and needed. Critics tended to view animalier work as primarily decorative and therefore, not worthy of their sustained attention. In 1837, when the Salon jury rejected pieces from a bronze tabletop hunting sculpture for the Duc d’Orleans, Barye decided to pursue his career outside that venue. His work did attract attention among colleagues, and he received occasional large commissions such as the sculpture of St. Clotilde for the Church of the Madeleine in Paris. More financially rewarding, however, was the marketing of small bronzes of animals to bourgeois art collectors. In fact, Barye established his own company, Barye & Cie, in partnership with Emile Martin, in 1845 for just that purpose. He deserves much credit for this pioneering effort to promote his art to the private art market. Sadly, the company didn’t generate sufficient income to ward off creditors, and in 1848, Barye lost his large inventory of casts to foreclosure; it was not until ten years later that he was able to recover them. Barye’s financial woes continued into the 1850s when he took a series of jobs, only to lose them to political appointees. His fortunes began to change by the middle of the decade, following the liberalization of the Salon juries under the short-lived Second Republic. Not only was his sculpture of Theseus Wrestling with the Minotaur accepted at the 1851 Salon, but he also began to receive commissions for much larger projects. For the renovation of the Pont Neuf, he was asked to create a series of 97 decorative stone masks featuring important historical, religious and mythological figures. This success led to a major commission for four allegorical groups symbolizing Strength, Order, War, and Peace for the expansion of the Louvre under Napoleon III; followed in 1857 by the promotional stone relief showing Napoleon I Crowned by History and the Fine Arts on the pediment of the new Sully Pavilion. At age 59, in 1854, Barye finally secured a permanent position as the Master of Zoological Drawing at Musée d’Histoire Naturelle, a position he would hold until his death. With renewed financial security, Bayre could also focus more fully on his animalier sculpture, which would increasingly receive supportive critical recognition for both its naturalism and its emotional power. Simultaneously, wealthy Americans were beginning to develop serious art collections, and Barye found a ready audience for his animalier sculpture. 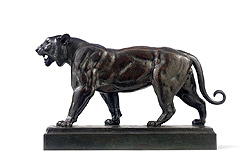 Winning the First Award for bronze sculpture for Jaguar Devouring a Hare at the Exposition Universelle in 1855 further spotlighted his work among potential buyers. In the 1860s, Barye turned his attention to the question of unifying the fine arts with the industrial technology of the time. He was a founding member of the Union Centrale des Beaux-Arts Appliqués à l’Industrie, which would evolve into the pivotal Union Centrale des Arts Décoratifs, an organization that strove to develop a flexible and effective working relationship between art and industry. Unlike the academic proponents of tradition, Barye believed that the tools of the industrial revolution could—and should—be employed to produce high quality design in all art forms. Although he undoubtedly disagreed with many of his academic colleagues on this subject, Barye was nonetheless elected to the Académie Française in 1868. In 1870, he moved to Cherbourg, most likely to avoid the terrible destruction of the Franco-Prussian War, which would have been very arduous for a 75-year-old man. The following year, at the end of the disastrous conflict, he moved back to his hometown where he died five years later on 29 June 1875 at age 80.